2) Spoil your taste buds’ at a beloved Eastside eatery. Juan in a Million’s infamous Don Juan breakfast taco. Photo: Flickr user Steve Snodgrass, CC licensed. 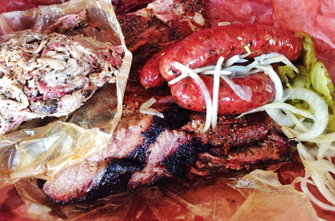 Franklin’s usual fare — pork ribs, sausage, brisket, pulled pork. Photo: Flickr user T. Tseng, CC licensed. East Side King 1618 1/2 E 6th St. 512-422-5884. Open Tues 12 p.m. to 2:30 a.m., Wed – Fri 6 p.m. to 2:30 a.m., Sat 6 p.m. to 12 a.m.
Sugar Mama’s Bakeshop 2406 Manor Rd, Suite B. 512-912-6628. Open Tues – Thurs 10 a.m. to 10 p.m., Fri – Sat 10 a.m. to 11 p.m., Sun 10 a.m. to 4 p.m.
Franklin Barbecue 900 E 11th St. 512-653-1187. 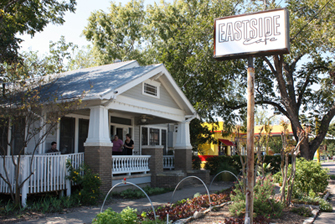 Open Tues – Sun 11 a.m. to 2 p.m.
Eastside Cafe operates out of a house. Photo: Flickr user Kari Sullivan, CC licensed. John Mueller Meat Co. 2500 E 6th St. Open Thurs – Tues 10:30 a.m. to 6 p.m.
Dan’s Hamburgers 844 Airport Blvd. 512-385-2262. Open Mon – Thurs, Sun 6 a.m. to 10 p.m., Fri – Sat 6 a.m. to 11 p.m.
Cenote 1010 E Cesar Chavez St. 512-524-1311. Open Mon – Fri 7 a.m. to 11 p.m., Sat 8 a.m. to 11 p.m., Sun 8 a.m. to 4 p.m.
Eastside Cafe 2113 Manor Rd. 512-476-5858. 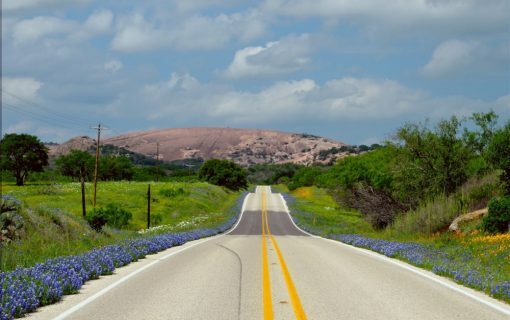 Open Mon – Thurs 11:15 a.m. to 9:30 p.m., Fri 11:15 a.m. to 10 p.m., Sat – Sun 10 a.m. to 10 p.m. 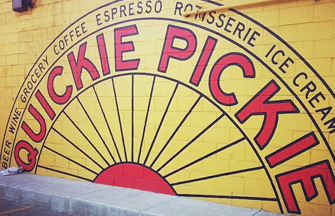 If you want it, there’s a good chance Quickie Pickie’s got it. Photo: Flickr user Gina Pina, CC licensed. Hillside Farmacy 1209 E 11th St. 512-628-0168. 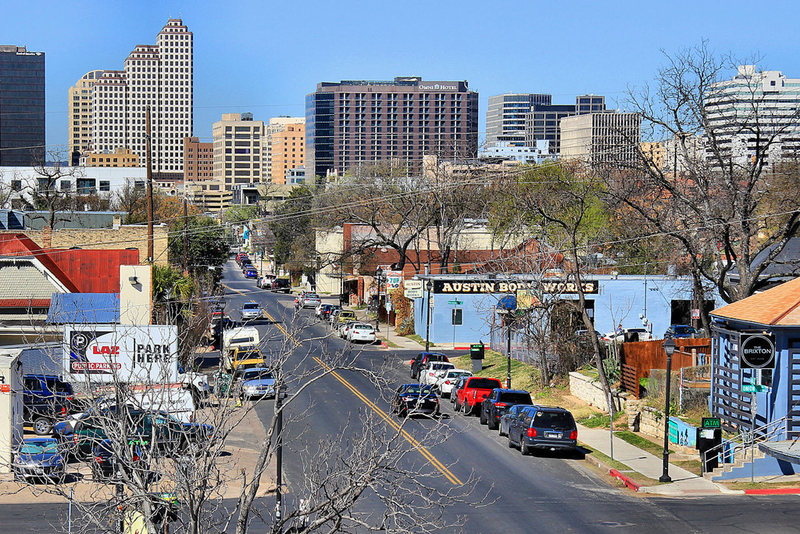 Open Sun – Wed 9 a.m. to 10 p.m., Thurs – Sat 9 a.m. to 11 p.m.
Nubian Queen Lola’s 1815 Rosewood Ave. 512-474-5652. Open Mon – Fri 8 a.m. to 7 p.m. (Wed – Fri 9 p.m.), Sat 5 to 9 p.m. The Buzz Mill 1505 Town Creek Dr. 512-912-9221. Open daily 24/7. Bennu Coffee 2001 E Martin Luther King Jr. Blvd. 512-478-4700. Open daily 24/7. East Side Pies knows what you want. Photo: Flickr user Kari Sullivan, CC licensed. Salty Sow 1917 Manor Rd. 512-391-2337. 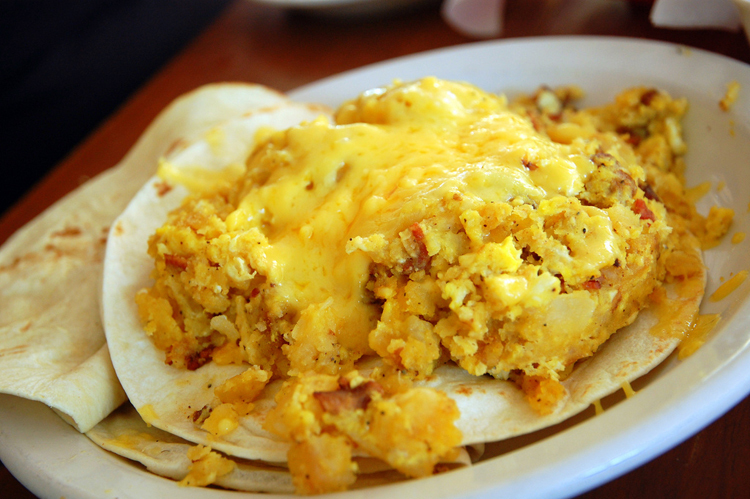 Open Sun – Thurs 4:30 to 10 p.m., Fri – Sat 4:30 to 11 p.m.
Juan in a Million 2300 E Cesar Chavez St. 512-472-3872. Open daily 7 a.m. to p.m.
Mi Madre’s Restaurant 2201 Manor Rd. 512-322-9721. 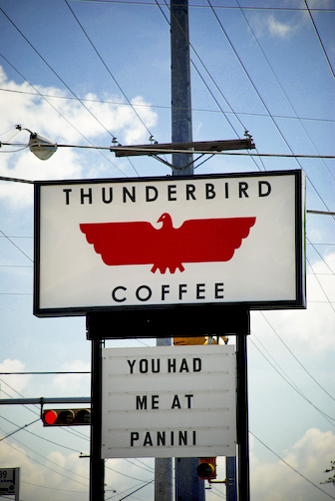 Open Mon – Tues 6 a.m. to 2 p.m., Wed – Sat 6 a.m. to 10 p.m., Sun 8 a.m. to 4 p.m.
That’s clever, Thunderbird. Very clever. Photo: Flickr user Shannon, CC licensed. Veracruz All Natural 1704 E Cesar Chavez St. 512-981-1760. 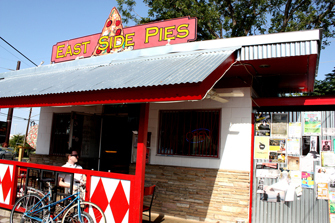 Open daily 8 a.m. to 3 p.m.
East Side Pies 1401 Rosewood Ave. 512-524-0933. Open Sun – Thurs 11 a.m. to 10 p.m., Fri – Sat 11 a.m. to 11 p.m.
Spartan Pizza 1007 E 6th St. 512-484-0798. 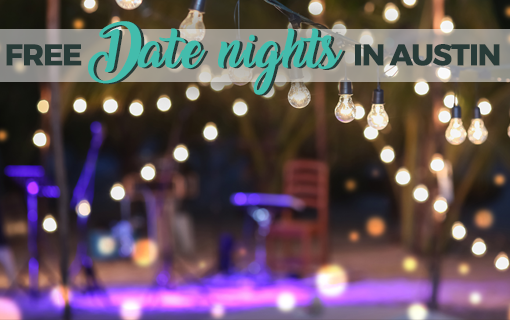 Open Sun – Thurs 11 a.m. to 10 p.m. (Sun 9 p.m.), Fri – Sat 11 a.m. to 3 a.m.
Contigo 2027 Anchor Ln. 512-614-2260. Open Mon – Wed 5 to 11 p.m., Thurs – Sat 5 p.m. to 12 a.m., Sun 10:30 a.m. to 2:30 p.m.
Red Star Southern 1700 E 6th St. 512-962-3674. Open Mon, Thurs – Fri 6 p.m. until sold out, Sat – Sun 2 p.m. until sold out. Haymaker 2310 Manor Rd. 512-243-6702. 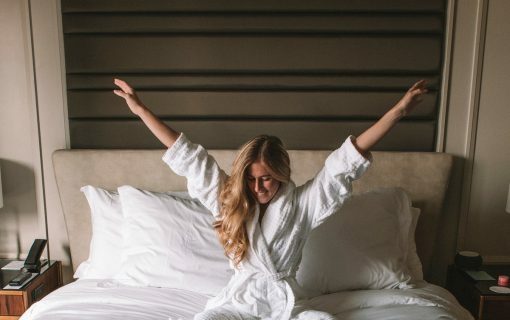 Open Sun – Fri 11 a.m. to 12 a.m., Sat 11 a.m. to 1 a.m. Counter Culture 2337 E Cesar Chavez St. 512-524-1540. Open daily 11 a.m. to 10 p.m.